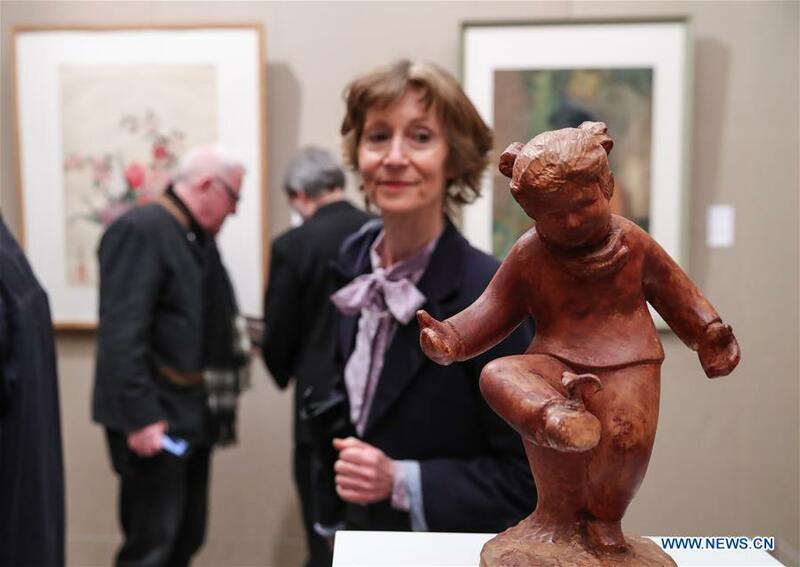 PARIS, March 25 (Xinhua) -- A ceremony and a series of events were held here on Saturday to mark the centennial of the Work-Study Movement ahead of Chinese President Xi Jinping's visit to France. Starting in 1919, thousands of progressive young Chinese went to France, where they worked in factories in Paris, Lyon and Montargis to pay for their studies in the European country. Some of them became interested in Marxism and established one of the earliest Chinese communist party groups in France. Among these prominent figures were late Chinese leaders Zhou Enlai and Deng Xiaoping. The movement has also promoted cultural and people-to-people exchanges between the two sides. The ceremony and the events were held in the China Cultural Center in Paris. At the ceremony, a sculpture by Wu Weishan, a famous Chinese sculptor, was unveiled. The bronze embossment, which shows a group of Chinese revolutionaries, will be put in Montargis, a Southern French city where many of those revolutionaries worked and studied. "Sculpture must have spirit. The spirit of this piece is the struggling of the Chinese people for national rejuvenation and the friendship between China and France," said Wu. Jiang Jianguo, deputy head of the Publicity Department of the Communist Party of China Central Committee, told the ceremony that with the events, China wants to show its appreciation for those who have helped the country in the past and to preserve friendship between the two countries. "Through history can we be inspired to solve the problems in the present," said former French Prime Minister Jean-Pierre Raffarin, who attended the events on Saturday and unveiled the sculpture together with Jiang. Raffarin said what brings France and China together now is their shared world view. Both countries believe that the tenser the world situation is, the more support for cooperation and multilateralism is needed, he said. The China Cultural Center also saw the premiere of a TV documentary introducing the movement's history. The documentary was jointly produced by the French channel of China's CGTN and the French TV5 Monde. It featured historical video clips and narrations by the descendants of the movement's participants. Yves Bigot, director general of TV5 Monde, said at the premiere that the movement was at the root of the French-Chinese friendship over the past century. This year also marks the 55th anniversary of diplomatic ties between China and France. In his signed article titled "Move Together Toward Common Development" published Saturday in leading French newspaper Le Figaro ahead of his state visit to the European country, Xi said he will bring "goodwill" toward France with him on his visit. "Such goodwill is based on the admiration both from the Chinese people and from myself for the splendid history and culture and the unique charm that France has to offer," he said in the article.